Home » Uncategorized » The Fantastic Dolomites! As a finale for the early summer’s tours with Explore and Mont Blanc Adventures, Mountain Experience seized the opportunity for a short notice walking tour based in Dobbiaco, Sud Tyrol. This fascinating region was previously part of the Austro-Hungarian Empire and was ceded to Italy following the bitter trench warfare across the mountains during the first World War. Although it is now proudly part of Italy, the area still retains a much more “Austrian” feel with a more northern cuisine and most people speaking German as their lingua franca. Just about everywhere has got two names, one in Italian and one in German. The scenery is absolutely stunning with breathtaking views in every direction. 11 clients undertook journeys on foot, by bus, train and cable car, thus ensuring the maximum time could be spent on the trails that criss cross the area, even strolling back and forth into Austria on one day. 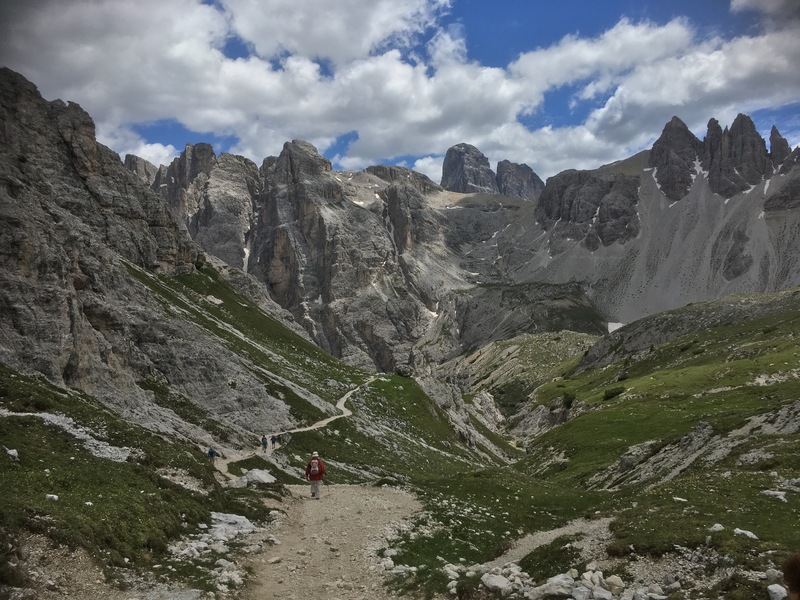 Walks took us below the iconic peaks of the Tre Cime and culminated with ascents of Monte Elmo (2,443m) and Monte Arnese (2,550m) on the Italian Austrian border. Several of the team enjoyed themselves so much that they are already planning a return visit for next year! By Mountain Experience in Uncategorized on 03/07/2018 .